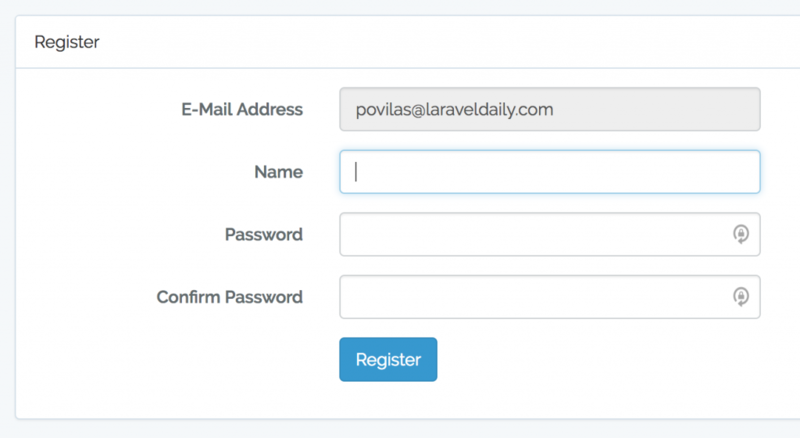 Laravel comes with great Auth out-of-the-box. But some projects don’t allow public registration, they send invitation links instead. This article will show you how to implement it. To store our invitations, we will have a separate DB table invitations, with three fields: email, invitation_token (will be generated randomly) and registered_at (when invitation actually converted to user). There are various ways to implement this, but we will assume that users can request an invite, by entering their email. Blade file resources/views/auth/request.blade.php is really similar to login.blade.php, just different POST action for the form. Basically, we’re restricting invitations to one only per unique email. Notice: Yes, the encoding algorithm is pretty random, you can use something like UUID or anything you prefer. This one is pretty simple – we just need to view all the invitations in a table, and administrator will copy-paste the links and send them wherever they like – via email or Slack etc. * Invitations group with auth middleware. * Even though we only have one route currently, the route group is for future updates. Notice: For simplicity, we’re just checking user’s email to be admin@admin.com, but in real projects you probably want to implement roles/permissions in Laravel or with a package like Spatie Laravel Permissions. In other words, we will use the same /register URL but will accept it only with ?invitation_token parameter. This is our next step. Now, let’s say someone has got an invitation link: yourdomain.com/register?invitation_token=XXXXXXXXXXXX. How to process it? * Only for GET requests. Otherwise, this middleware will block our registration. * No token = Goodbye. * Lets try to find invitation by its token. * If failed -> return to request page with error. * Let's check if users already registered. * If yes -> redirect to login with error. There are a few more things we check there – whether the link was already used, or whether invitation_token is invalid. Aaaaaand, that’s it. With these steps, you have an invite-only registration system.